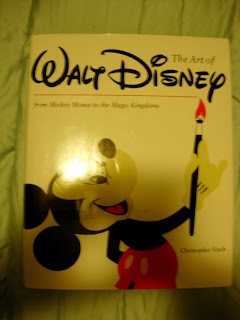 This is the book, "The Art of Walt Disney" by Christopher Finch. The other part of the title reads: "From Mickey Mouse to the Magic Kingdoms". This book has been published several times over the years, and has become signifcantly thicker, especially since Disney went through its rebirth in 1984 and has become an entertainment powerhouse. The copy of the book that I have here was published in 1995. The first edition of this book was published in 1973. This book shows the history of Walt Disney and his company. It includes black and white and color photographs of Disney animated and live action films, as well as the theme parks. When this book was published in 1995, the publisher claimed that this was "the only complete, illustrated history of the Walt Disney Company".